African animal art symbolizes the relationship between man and nature. African animal art has long since been used by the many various tribes to depict the relationship existing between man and nature. Symbolism is entirely in connection with this art form. 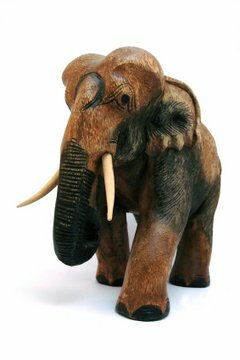 From the prehistoric cave paintings to the more elaborate sculptures and ceremonial masks, African animal art has and continue to evolve with the times. In Africa, ownership of animals equal with honor and power. A sculpture of an ancestor with a horse, depicts the great honor and respect of the sculptor to his ancestor. The vibrant African culture and traditions have brought forth myths and other beliefs that have associated animals with spirits. African animal art have played a vital role in giving character to these spirits which are believed to often disguise themselves as animals. These type of art are mostly meant to symbolize religious importance and take part in divine rites and festive ceremonies. Each animal within the wild of Africa possesses characteristics that are comparable to that of the personalities of high ranking people. This is the reason why many chiefs and kings keep art that symbolize these animals or are made out of some parts of these animals like bones or skin. In an ethnic group called Songye, the following gifts are given to the newly chosen chief: a fox skin—representing an agile thought; a lion skin—representing strength and courage; and a leopard that represents clever and fast nature. In most tribes that lie along the equator, crocodiles symbolize deceitful, evil spirits. To cast these spirits out of their villages, crocodile masks are used in rituals. The Ijo people who are sheltered within Nigeria believe that these creatures are messengers of the divine beings governing the lakes and the rivers. A tribe called Abomey in Benin considers a crocodile as a representation of their mythical sun-god, Lisa. The Baule-Yaure tribe of the Ivory Coast thinks of elephants as icons of supreme political eminence. Masks with distinct features such as huge ears, trunk and tusks are normally worn by tribal chiefs and the oldest among the people in the village. An ethnic group known as the Guerre-Wobe, found in Liberia crafts masks that blends human features with that of powerful beaks of hornbills. This kind of art is used in village rituals to inspire cooperation on community works and also to cast magical spells. Each animal that belongs to the exotic wildlife of colorful Africa takes part in the African animal art, brought about by superstitions and rich cultural heritage. Though almost every crafted piece of art based on an animal is beautiful in its own right, each tells a different story for every different tribe. Copyright All-About-African-Art.com All Rights Reserved.